Ingrid and I are doing some sorting and culling of photos, which means we’re looking at a LOT of cat photos. Which means I’m going to start posting more of them. Because please. Look at them. It’s like a glamour shot of a folk-rock duo. The Indigo Cats. Ingrid and I are re-watching the entire Steven Universe series — yet again — and I thought I’d blog some of my observations. Please note: I’m not writing these as a series summary or recap. I’m just writing down some of my observations and reactions, about individual episodes and the show as a whole. These posts will probably make more sense if you’ve already seen the show, but I hope they inspire the rest of you to check it out, as it really is one of the richest and most emotionally intense things I’ve seen on TV. 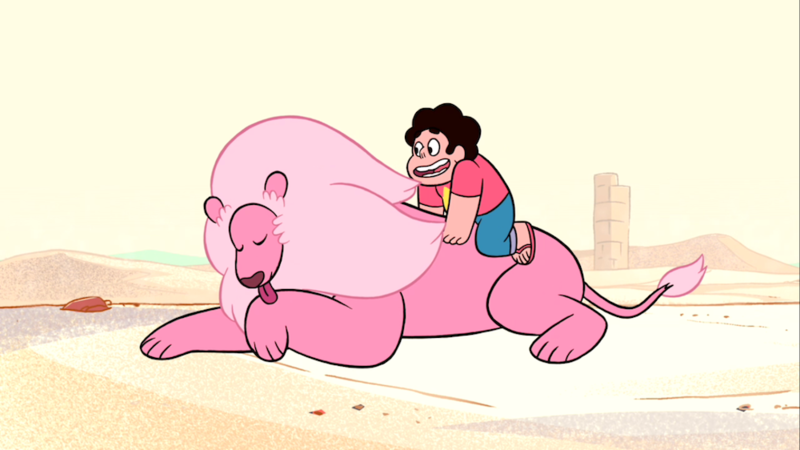 This post contains spoilers about Steven Universe: the show as a whole, and/or about Episode 10: Steven’s Lion. Lion, Lion, Lion, Lion, Lion, Lion, Lion, Lion, LION! When you ask Steven Universe fans which character they identify with most — not their favorite, but the one they identify with — it seems, from my not-at-all scientific observations, that the most common answers are Amethyst and Pearl. * People who are more anxious and detail-oriented identify deeply with Pearl; people who are more casual and impulsive identify with Amethyst. When I thought about which Stevenverse characters I identified with most, though, for a while I was stuck. I’m anxious, but nowhere near as much as Pearl; I’m impulsive, but nowhere near as much as Amethyst. I have some things in common with many of the characters, but none of them jumped out as my personal stand-in. And then it struck me: Lion. Lion is a sensualist, a lover of food and naps. Lion is not very attentive to authority: he’s not defiant of authority, so much as he is baffled by the very idea. When he’s asked or told to do something, he first has to understand why it’s important (or why it would benefit him: in “It Could’ve Been Great,” Steven has to explain to him that the destruction of the earth will mean the loss of treats and naps). Lion also tends to get lost in his own private world, and he can be a little clueless about what other people want from him. But Lion is also intensely affectionate, and fiercely loyal. Lion will go to great lengths to help and protect Steven and others he cares about. (Well, mostly Steven.) Yup — I’m Lion. 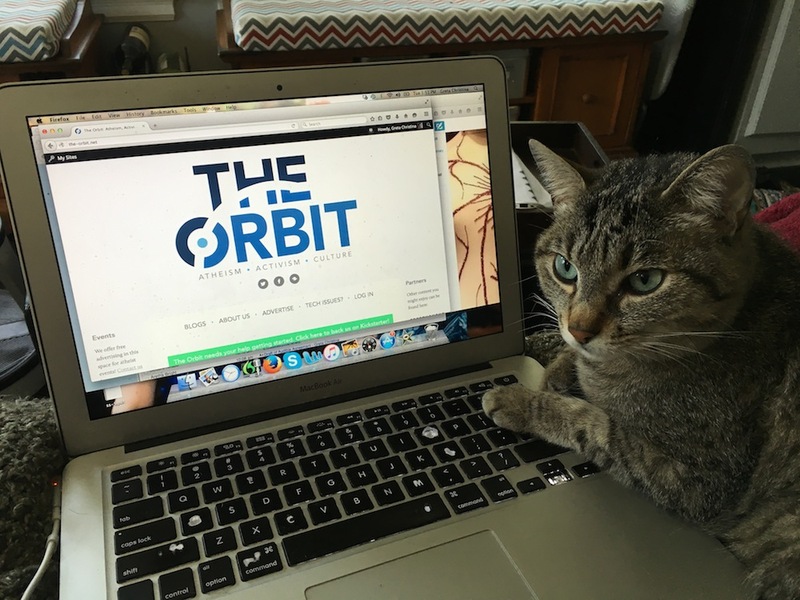 Comet wants to blog! She has lots to say about atheism and social justice from the feline perspective. She has passionate views on mealtimes, closed doors, access to delicious power cords, and the inequitable distribution of butter and cheese. What do you say, Orbiters? Should we bring her in as the newest member of the collective? 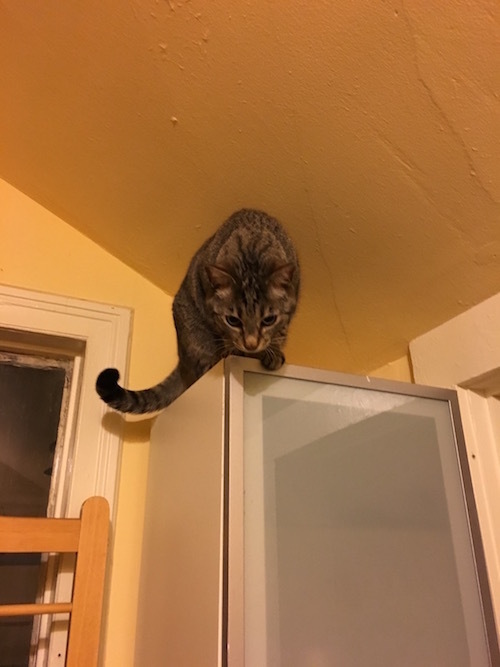 And now, partly to do some tech testing on the blog, and partly because it wouldn’t be an atheist social justice blog site without cat pictures, here are some cat pictures. 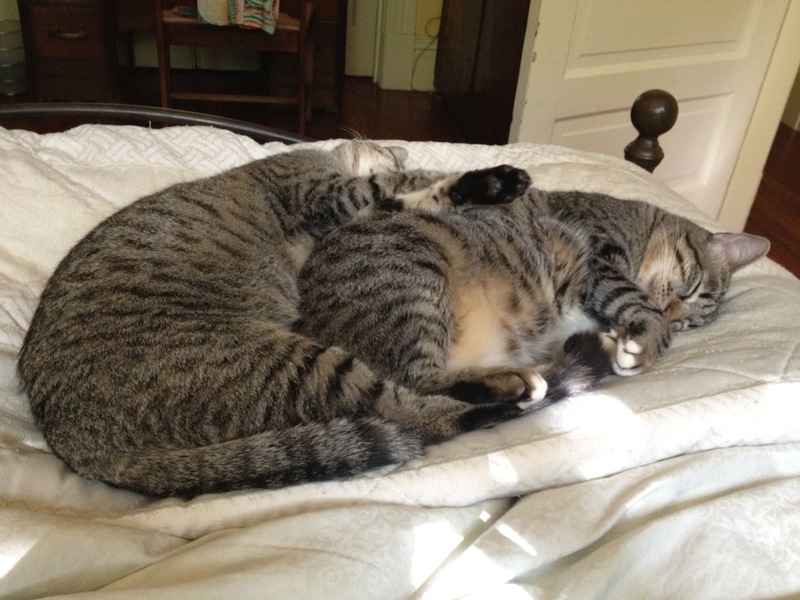 It’s the two-headed tabby monster! Run for your lives! Do Cats Know What We Think Is Cute? 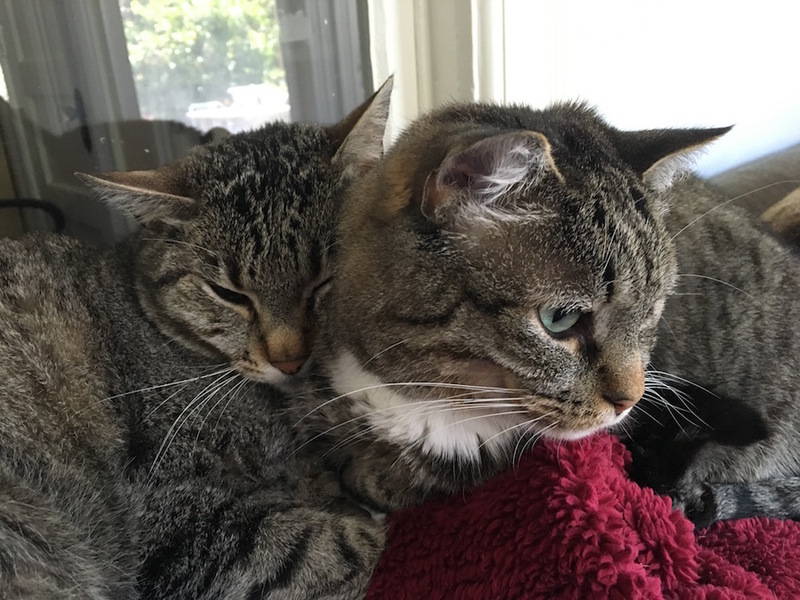 I swear — sometimes I think our cats know what’s cute. Or, to be more precise: I don’t think our cats have the faintest concept of “cuteness.” But they know what gets our attention. 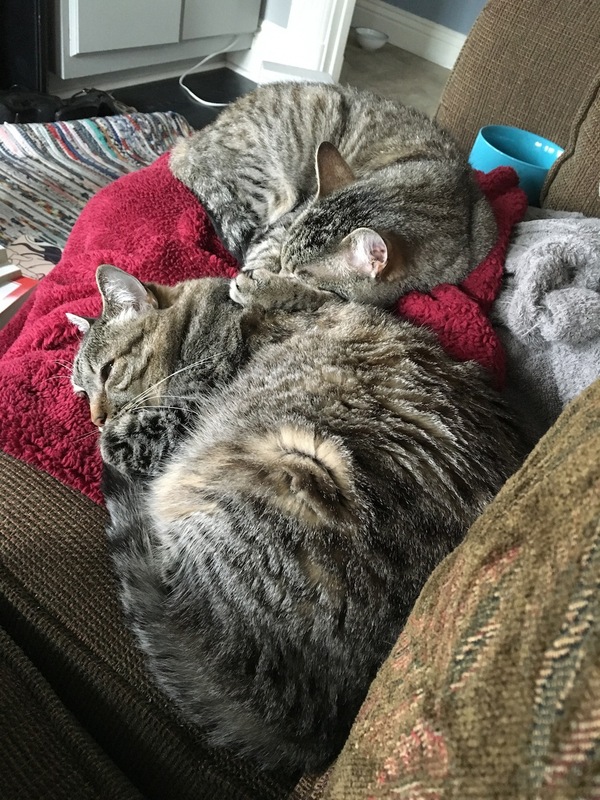 They know that when they do the tuck-and-roll, the upside-down gaze, the crossed paws, the stretched-out paws, the nuzzle-nibble, the squirming on the back, the paw over the nose, the showing off of the belly with the paws in the air, the paws wrapped around our hand — it gets our attention. It gets us to give them skritches, and make cooing noises. It gets us to put down our devices or stop watching TV, and focus the full firehose of our attention on them. They know that when they do certain particular cat-like things, it gets our positive attention — more so than when they just sit there. Comet especially. Talisker, I think, doesn’t care that much what we think of her — but Comet is an attention hog, and she knows how to go through her paces to get the attention she craves. I’m saying felinity is performative. 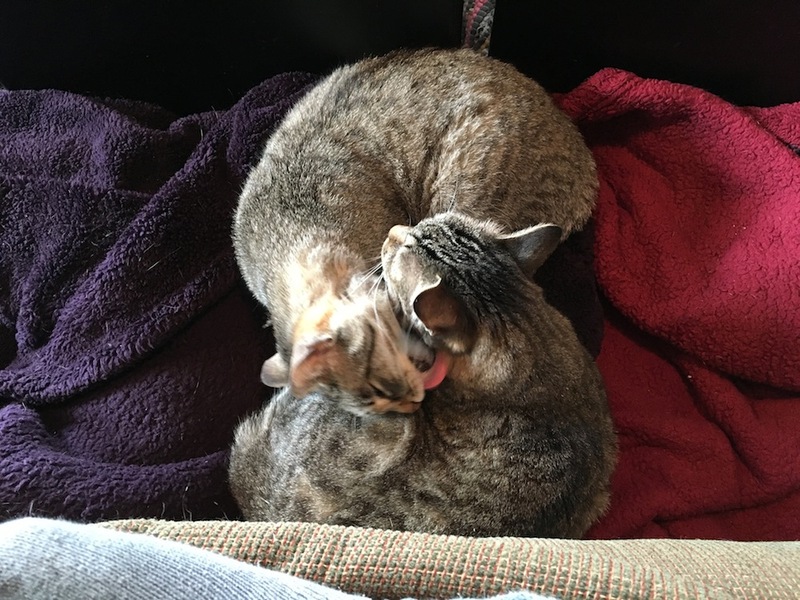 Greta’s Secular Students Week Blogathon – Pics of the Cat Bath! My mini-blogathon for Secular Students Week is almost over! Two more donations have come in since the last round of cat pics — so as promised, here are more cat photos! I’m feeling generous, so you get the full five-photo series of The Cat Bath! Remember — each donation, no matter how small, gets a new cat picture! Greta’s Secular Students Week Blogathon – More Cat Pics, With Snuggling And Bonus Yawn! 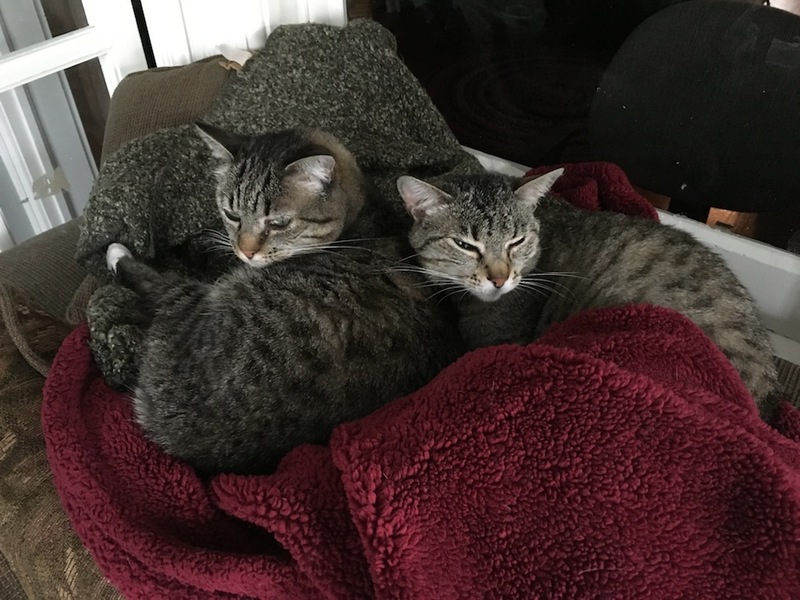 Two more donations have come in since the last round of cat pics — so as promised, here are two more cat photo! With a bonus one this time, just because. In this series, you’ve got the head resting on the fuzzy belleh; you’ve got the upside-down gaze; AND you’ve got the yawn! It’s the whole package, people! Greta’s Secular Students Week Blogathon – Another Cat Photo! Another donation has come in since the last round of cat pics — so as promised, here’s another cat photo! Here is Comet, giving the adoring upside-down gaze. Comet loves you so much — and she especially loves it when you support the Secular Student Alliance!